I have a confession to make….I bought these KEEN Oakridge Mid Boots a (very long) while back and I have only recently lifted them out of the box to wear them outdoors! The reason is that I struggle to find hiking shoes that fit and look good. So when I do find a good option, I’ve learned to buy rather than assume they will be available when I need them. It’s only now that I needed them! So while this approach appears a bit over the top, it is grounded in practicality and the reality of having a ‘non standard’ foot. 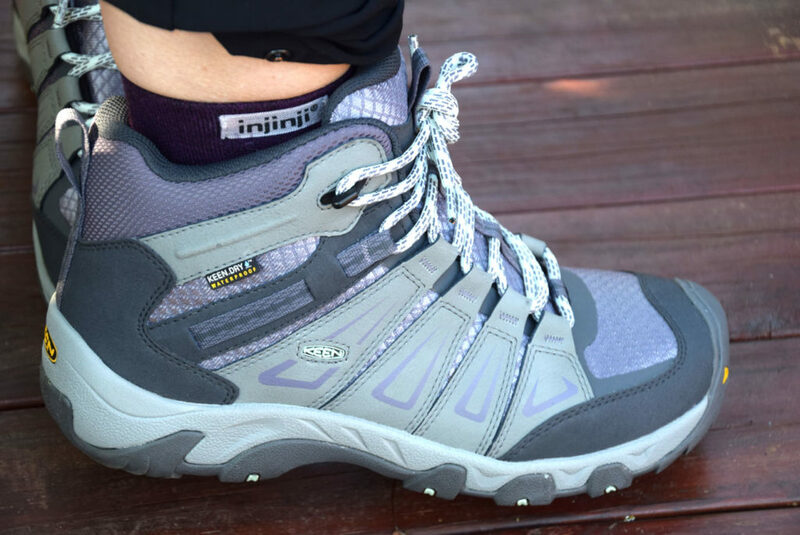 I need sturdy, comfortable and well-fitting boots in a wider fitting than is usual in women’s hiking boots. While the KEEN Targhee II Mid trail hikers are all that, the Keen Oakridge Mid Boots are likewise with the added bonus that they look great too! When I first saw these boots I was a bit sceptical about whether they would be wide enough but they are. Its the styling and design that makes all the difference. These boots are comfortable, a wider fit and seriously sturdy. At 872 grams per pair, they are deceivingly lightweight for a boot! Be warned however – the info on this boot suggests that you order a 1/2 size larger than your usual size particularly if buying online. In my review of the Vasque Taku GTX I referred to them as ‘aesthetically pleasing’. In comparison, the Oakridge boots are downright stylish. The boot ‘looks’ slimline but isn’t. I accept that comfort is THE most important factor but its nice to look good too. The colouring is referred to as ‘Grey Shark’ but it looks mauve and purple to me – another added bonus! The Oakridge boots provide plenty of room and length in the toe area, and the locking eyelets at the top allow you to achieve the right adjustment in the lacing as well as the ankle. 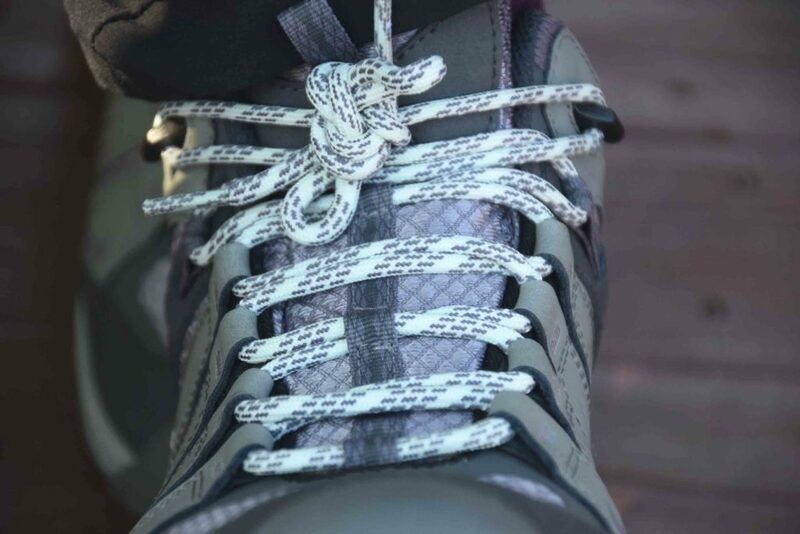 I usually cross over the laces between the third and second from the top eyelets to allow ‘looser’ lacing around the toes and firmer lacing closer to the ankle. However, I don’t feel the need to do this with the Oakridge boot. 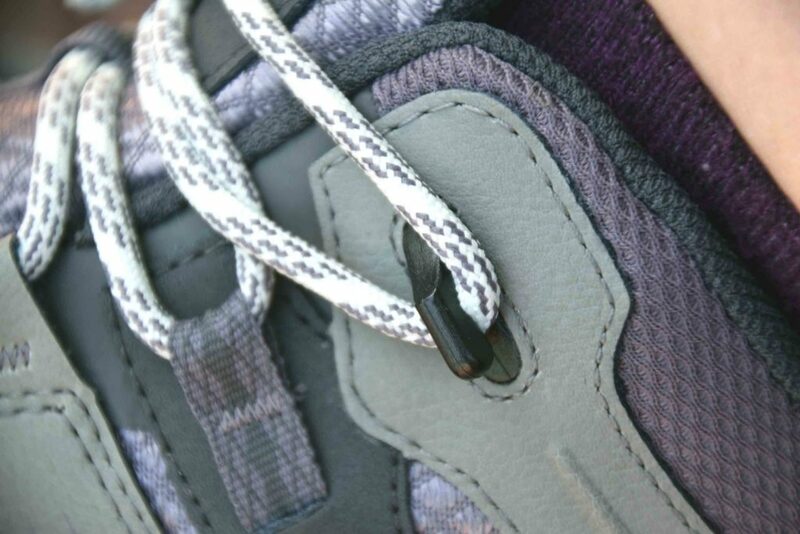 The padding in the upper part of the boot is generous which adds to the comfort factor. These boots have a waterproof leather and textile upper so will withstand the toughest conditions. 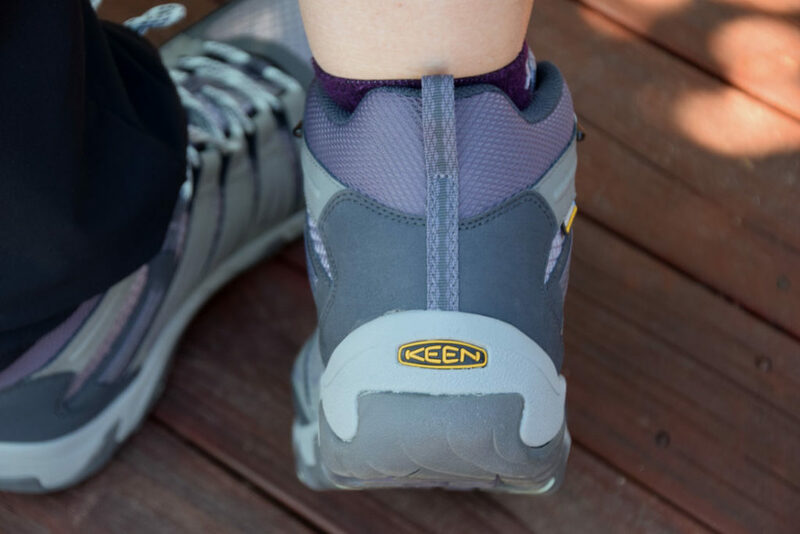 KEEN toe guards are usually robust providing plenty of protection on rocky terrain and these ones follow suit. For me that is essential….I have the knack of stubbing my toes on the smallest pebble! There is one drawback which is the soles of these boots – I find they don’t handle dry, powdery terrain as well as I would like. 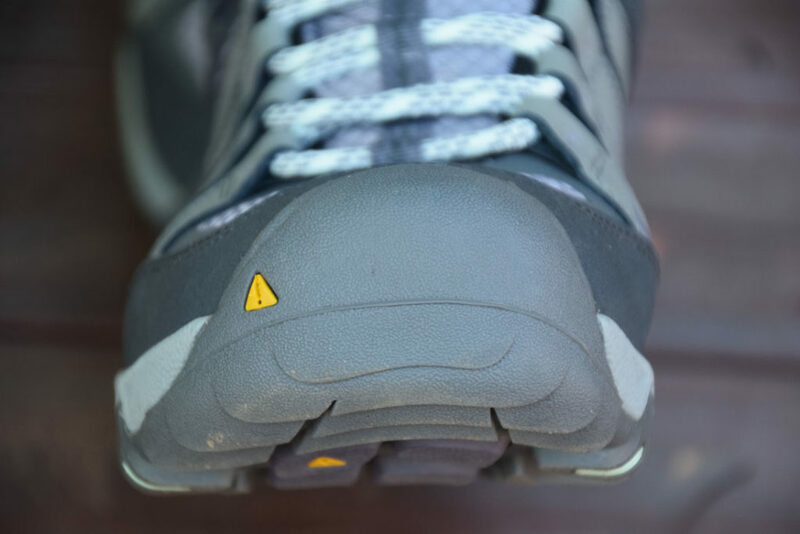 The Oakridge’s come with what KEEN refers to as a ‘removable metatomical footbed’ – that is footwear code for a removable insole. They are very comfortable with this insole and I am yet to opt for Superfeet insoles which can be purchased separately. I plan to wear the Oakridge boots on our upcoming hike of the Ten Peaks Walk in Kosciusko National Park. I am very confident they will keep my feet comfortable and dry if the weather turns! I recommend the Oakridge boots for everyone looking for comfort, sturdiness and style. 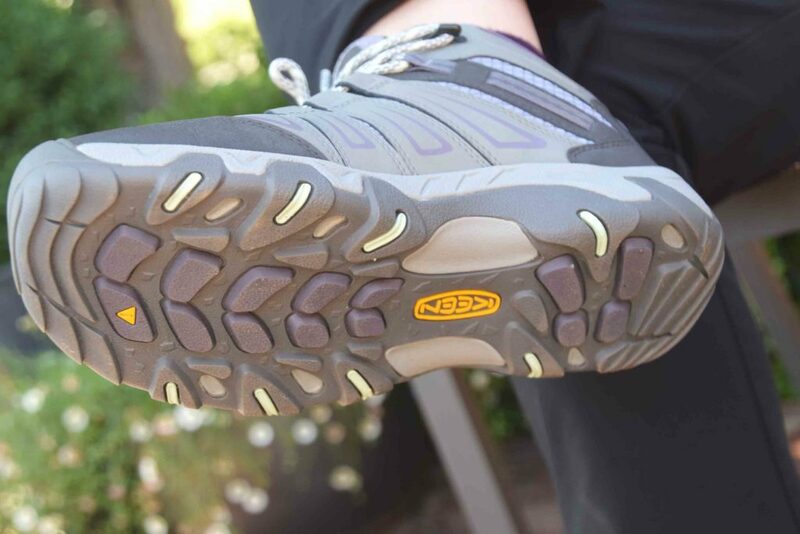 You can purchase the KEEN Oakridge Mid WP Women’s Boot online from Wild Earth. This boot is also available in a low cut version.